The large-scale capacity Standard Line for production of natural bone broths, soups and sauces is designed to address the manufacturing of more healthier food products, including clean labels with high commercial value for professional, consumer and industrial markets. The line is designed with large volumes in mind, both capacity in bone raw materials and end products. Production is easy to scale up in capacity depending on your demand, meaning that daily volumes from 4.5 tonnes of natural broth up to 100 tonnes can be achieved. Despite the large capacity potential, the line provides simple and flexible operation due to the high degree of automation achieving consistent top-quality of your food labels. Such scalable production line is highly cost-effective and very efficient to operate. Further along the process, the SHS Dryer line allows cooked bone residue drying and processing for dried proteins for use in dry pet foods, and bone powder for use in fertilisers and animal feeds, resulting in zero bone waste. 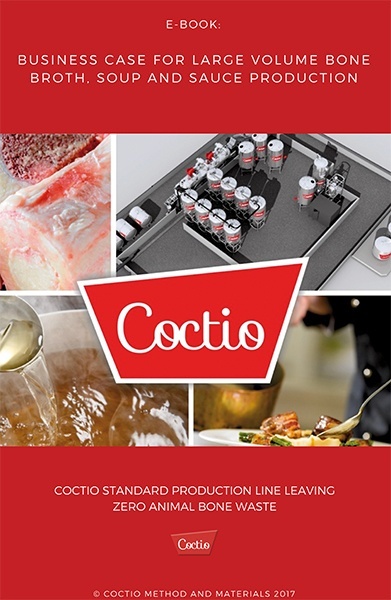 The turnkey line is delivered pre-assembled, which ensures quick and easy installation by Coctio installation team. The line is ready for connection with the pipes to Coctio equipment and the available power supply reducing installation expenses to a minimum. The large volume line requires minimum 500 m² production space for its smallest line installation. One batch produces 4,500 litres of natural bone broth which requires 3,500 kg of animal bones and 4,200 litres of water. The batch volume of concentrated broth or demi-glace is roughly 1,710 litres. Also, one batch generates 350 kg of fat and approximately 3,150 kg of cooked bone residue. The fat is purified, kept in liquid form and stored to use it in own food production or can be sold as the pure ingredient to other industries to make commercial products. The cooked bones can be dried and further processed into dried meat and bone powder in a Coctio Dryer system and sold on the industrial markets. Standard production line’s maximum daily and yearly capacity and projected production in terms of end-product and target market vary according to your demands and the number of cooker modules you have for a Standard line. The diagram below illustrates the Standard volume production process and outputs. A simple-to-use, fully automated process control ensures that all operations are repeated as desired for every single batch of bone broth. 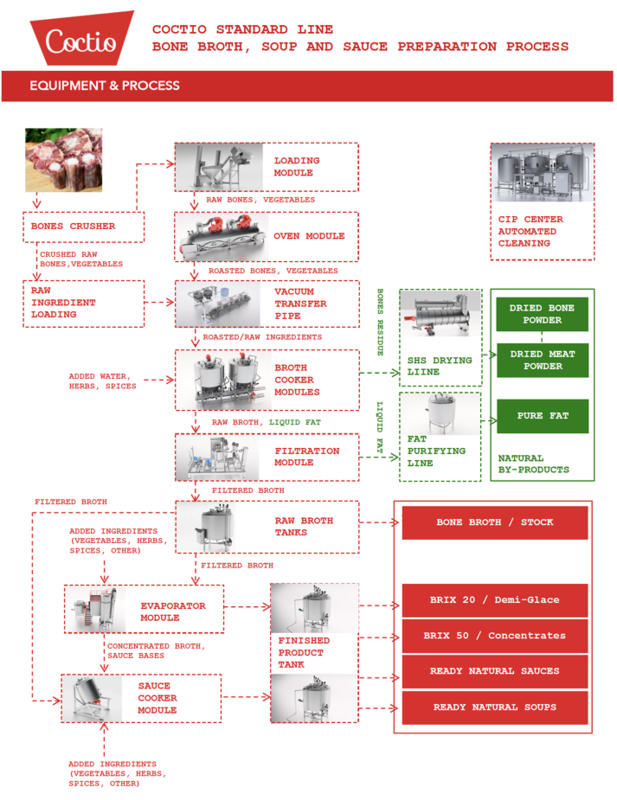 This allows you to produce large quantities of end-product over a number of batches with the same level of quality and characteristics every time. The automation also allows you to have a very efficient and consistent production line that requires very little supervision. Expand your business knowledge in profitable large volume bone broth, soup and sauce production industry and learn about its process technology, business opportunities and financials by downloading our free e-Books below! 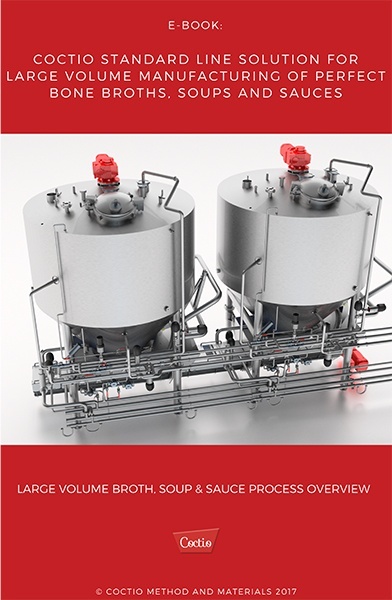 In this free guide, you'll discover a complete process description with equipment specifications for large volume manufacturing of perfect Bone Broths, Soups & Sauces. With it, you will be able to take full advantage of best practices for manufacturing operations of natural and organic bone broths and broth-based ready-made meals. Get this free guide to assess revenues, cost structure, financing needs and profits to operate a large-scale bone broth production facility by processing annually over 9 million kilos of animal bones into a range of natural bone broth, soup and sauce products and functional, clean-label friendly food innovations using bone broth as a natural ingredient.